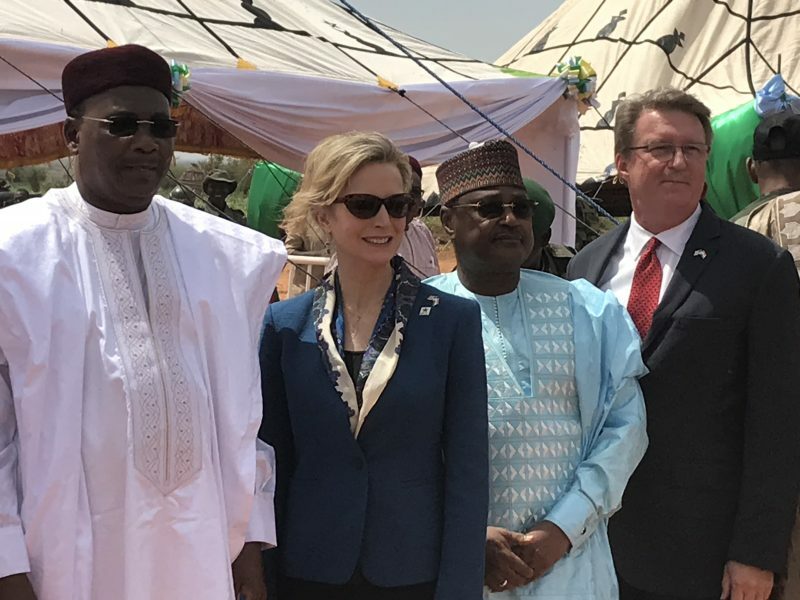 MCC VP Jeanne Hauch attends the MCC Niger Compact launch event in Niger on August 5, 2018. 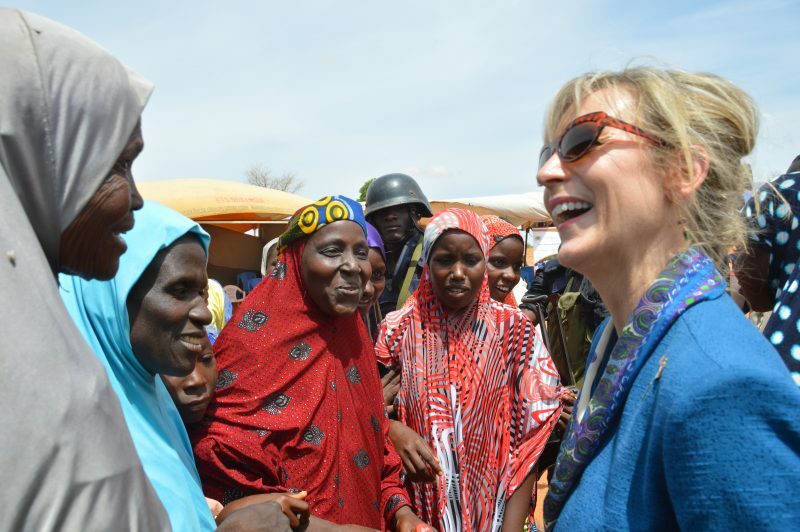 NIAMEY, August 6, 2018 – The U.S. Government’s Millennium Challenge Corporation (MCC) Vice President and General Counsel Jeanne Hauch visited Niger this week to celebrate the launch of the five-year, $437 million Millennium Challenge Compact designed to reduce poverty, promote economic growth and increase opportunities for Nigeriens. During the visit, VP Hauch participated in a compact implementation launch with the Government of Niger in Margou. Those present included Nigerien President Mahamadou Issoufou; Chief of Staff Ouhoumoudou Mahamadou; Governor of Dosso Moussa Ousmane; U.S. Ambassador to Niger Eric Whitaker; MCC Resident Country Director Kristin Penn; and the Millennium Challenge Account-Niger General Director Mamane Annou. MCC’s compact is upgrading the RN35 road, supporting businesses and creating new economic opportunities in and around Margou. MCC VP Jeanne Hauch joins President Issoufou and U.S. Ambassador to Niger Eric Whitaker for the MCC Niger Compact launch event on August 5, 2018. “The United States—through the Millennium Challenge Corporation, USAID, and the U.S. African Development Foundation—is committed to aligning its resources and programs to support Niger’s national strategies that improve performance in the agricultural sector, increase food security, and enhance community resilience. When we work together and coordinate our programming, these U.S. Government agencies, along with the efforts of the Government of Niger, can and will make a difference,” said Eric Whitaker, U.S. Ambassador to Niger. MCC’s Niger Millennium Challenge Compact, created in partnership with the Government of Niger, addresses major constraints to economic growth and investment in Niger, including a lack of reliable access to water for agricultural use and livestock and lack of access to markets. The MCC compact includes investments in a sustainable water supply, agricultural production, new infrastructure to improve market access, and management of natural resources, while seeking to empower entrepreneurs and small business groups. The compact will provide agricultural productivity and literacy training, with a focus on women and youth. MCC’s investments have the potential to benefit more than 3.9 million people, including women and youth. MCC and the Government of Niger signed the Compact on July 29, 2016. Implementation of the Compact started in January 2018, and will be completed within a strict five-year timeline. MCC is an independent U.S. Government agency working to reduce global poverty through economic growth. Created in 2004, MCC provides time-limited grants and assistance to developing countries that meet rigorous standards for good governance, from fighting corruption to respecting democratic rights. This press release was initially issued by the U.S. embassy in Niamey.